Okay, so they haven’t even broken ground yet, much less found Vulcans with whom to work, but right behind me is the spot where, in 2161, The United Federation of Planets is going to set up shop and create a Starfleet Academy. And just exactly what was I doing in San Francisco? Not casing out potential academy spots, for the future or other purposes. No, I accompanied my husband on a business trip and then we had ourselves a much-needed break. Andrew’s superior officer in command, a wonderfully generous and kind person, offered to guide us out-of-towners on a bike ride from Fisherman’s Wharf to Sausalito, a distance of roughly 8-10 miles, or 13-16 kilometers. 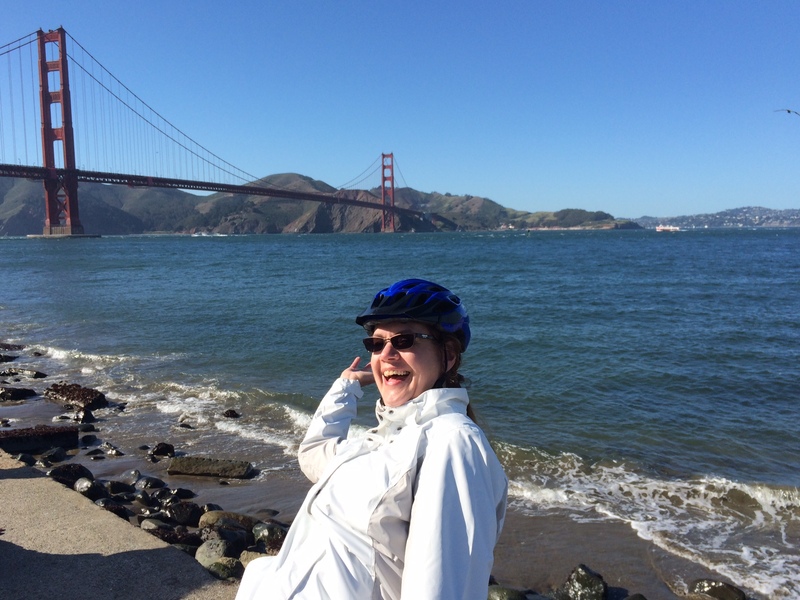 As you can see, it was a gorgeous day, a bit breezy perhaps but fine enough to hop aboard our trusty rented bikes and fly like the wind over the Golden Gate Bridge. Did I mention wind? At some points in the trip, gale-worthy gusts puffed up our jackets and nearly knocked us loose from our seats, but that only added to the excitement. As I chugged up the occasional hills leading to the bike-riding side of the GGB, I reminded myself that my endeavor paled in comparison to those future cadets intrepidly charging forward on into space. Tucked away in the back of my mind lurked the possibility of THE ONE, you know, that ginormous earth-sinking quake just waiting for the right moment to unleash its wrath. You laugh? My first trip to California (Los Angeles, that time) was punctuated by a 6.0 earthquake, forever imprinting in my mind it could happen again. Shoving that nasty thought away, I turned onto the bike lane and wheeled my way across this legendary span. About halfway across, I turned my head and noticed the Pacific shimmer in the afternoon sun, and a fog bank in the distance waiting to spread across the bay and city. Sky, cloud and sea blended into an undulating band of grey matter converging on the horizon. Hmm, I thought. What mysterious being, event, alien ship or malady is concealed behind that? Will it strike now? Or have the decency to wait until I make it across before it generates wholesale terror? For me, what’s also kind of remarkable about cycling next to the Pacific is that I grew up on the Atlantic – literally – at a seaside town in New Jersey. I’m used to seeing sunrises instead of sunsets over the ocean. That, and it’s a border, the west end of the continental United States, and beyond it lie countless islands, some states, territories and other nations, until it reaches Asia and Australia, among other places. It’s a bit humbling to regard the Pacific in those terms, but if I were on a spaceship, it’d be pretty meaningless in terms of distance. Earthbound me thought it was pretty cool, though. Considering how fast the Enterprise will need to travel in order to traverse the wide expanse of space, I made good time across the bridge. In fact, I fairly whizzed across, compared to the nearly standstill traffic (there’s no such thing as rush hour here – it’s all blocked up, all the time). Then up ahead I noticed a sign: YOUR SPEED – 13 MPH. Me? Going 13 miles per hour? WOW! I’m a rocket ship racing into space! All too soon, the span ended and we turned down a sharp switchback hill leading to the road that would take us into Sausalito. Now I was charging ever close to the future Starfleet Academy – I’d go right past it! Closing my eyes for just a second, I’d be crossing the paths of the places where Spock, Kirk, Scotty, Uhura, Sulu, Bones, Chekov and the rest got their start. 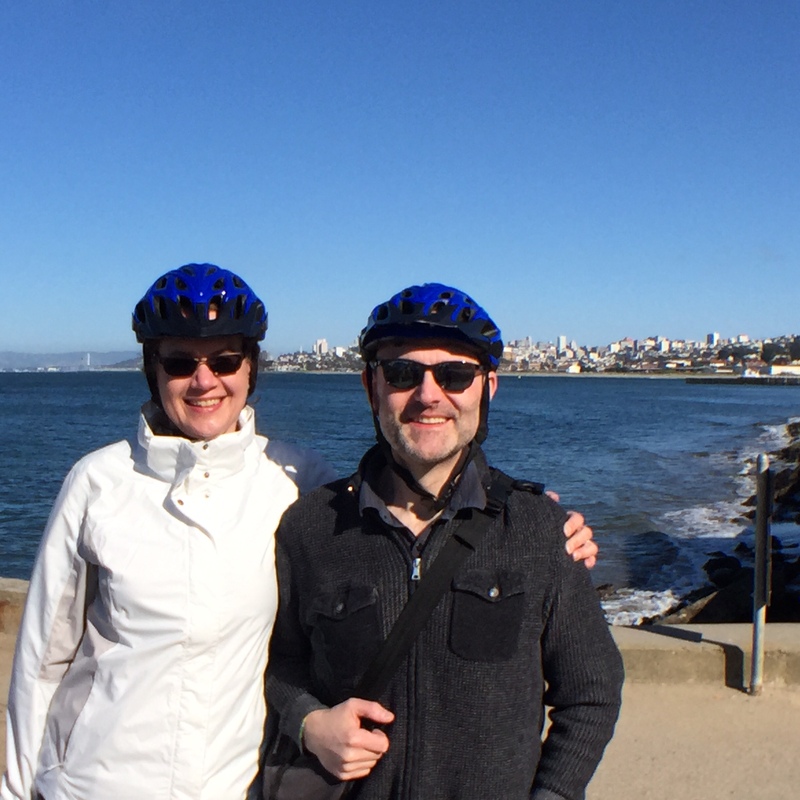 Finally, we pulled into Sausalito, a ritzy town housing rich, famous and other personalities. It’s not exactly my taste, but I’d manage it if forced to move there. All of us gathered in a group, parked our bikes and celebrated our tour’s end by heading right to the nearest cafe and downing glasses of cool beers or chilled California Chardonnays (and oh! They’re like sipping a slice of heaven). After, we headed back to San Francisco, ready for dinner and an evening of fun, all the while recounting what an amazing day it had been for such an adventure – all right here on Earth. « Faster, Stronger, Better – Now! This was an entertaining post. As a Star Trek fan I hope to visit there someday too. Given your description I’ll definitely take a bike instead of the car! It’s totally worth the trip! You’ll never regret it, even when you huff and puff up the hills.